1. Sprinkle the gelatin on the remaining 3/4 cup cold water and let sit for 3 minutes. 2. In a small saucepan over low heat, combine water and sugar. Stir continously until sugar dissolves. Add the gelatin and continue stirring until gelatin dissolves. 3. 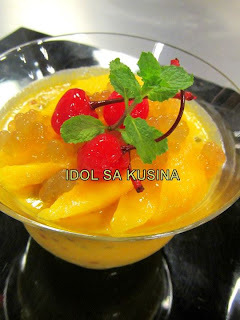 Combine the pureed mangoes and milk. Mix well. Add the gelatin and continue stirring until gelatin dissolves. 4. Divide mixture into individual bowls. Portion the sago among the bowls. Chill until set. Garnish with sliced cherries.